A delegation team of Catholic trustees representing OCSTA, Catholic teachers representing OECTA and Bishops from the Assembly of Catholic Bishops of Ontario (ACBO) representing Ontario’s Catholic clergy, joined in a show of unity and strength at Queen’s Park on May 29th as part of the annual Catholic Education Lobby Day at Queen’s Park. 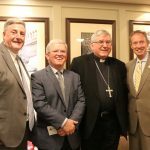 The event is produced by the Friends and Advocates for Catholic Education – better known as FACE and is an entity created out of a joint partnership between OCSTA, OECTA and ACBO. 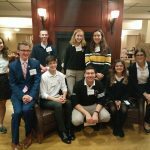 The purpose of the day was to raise awareness about the achievements and contributions of Ontario’s publicly funded Catholic schools to the life of our province, and in particular to the constituencies represented by the MPPs FACE delegate teams met with throughout the day. Delegates discussed current issues in education and provided to MPPs infographic sheets that provided timely facts about Catholic education at the provincial and local levels. TCDSB Trustee Ann Andrachuk, OCSTA Past President Kathy Burtnik, OCSTA President Patrick Daly, OCSTA Vice President Beverley Eckensweiler, Northeastern CDSB Trustee Colleen Landers and Dufferin-Peel CDSB Trustee, Thomas Thomas and OCSTA Executive Director Nick Milanetti. 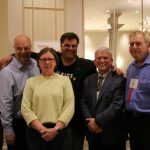 Chris Cowley, Michel Derikx, Barb Dobrowolski, Anthony Rocchio, Warren Grafton and Andrew Donihee. 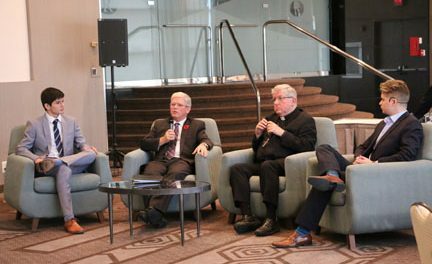 Archbishop of Toronto, Thomas Cardinal Collins; Archbishop Brendan Michael O’Brien, Archdiocese of Kingston; Bishop Gerard Paul Bergie, Diocese of Hamilton; Bishop Marcel Damphousse, Diocese of Sault Ste. Marie; and Roger Lawler, General Secretary, ACBO. Hon. Mitzie Hunter: I would like to welcome members for the Friends and Advocates for Catholic Education, FACE. They are attending question period this morning as part of FACE’s Queen’s Park day. I had the pleasure of meeting them this morning along with Minister Albanese. Of course, I would like to welcome Thomas Cardinal Collins, Archbishop of Toronto. 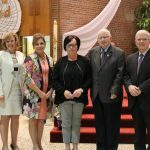 Joining Cardinal Collins, we have Bev Eckensweiler, who is the vice-president of OCSTA; Barb Dobrowolski, who is the second vice-president of OECTA; Nicolas Bottger, who is the president of the Catholic Board Council, student trustee; Manuela Zapata, vice-president of the Catholic Board Council, student trustee; and Carole Allen, project manager for FACE. Please welcome them to Queen’s Park, along with many others. 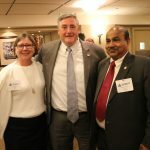 Mr. Harinder S. Takhar: I want to welcome Mr. Thomas Thomas. He’s a trustee for the Dufferin-Peel Catholic District School Board. He is my constituent and a good friend as well, so welcome. Hon. 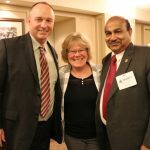 Jeff Leal: I just noticed a constituent of mine up in the west public gallery: Mr. Tim Moloney, who is a superintendent with the Peterborough Victoria Northumberland and Clarington Roman Catholic separate school board. Mr. Moloney. Mr. Jim McDonell: I’d like to welcome the Most Reverend Bishop Marcel Damphousse. He’s the former bishop of Alexandria-Cornwall and he’s the current bishop of Sault Ste. Marie. Welcome. 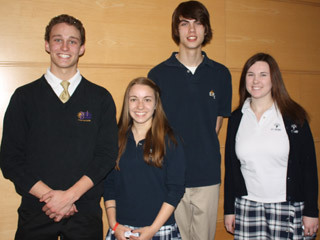 Student Trustees from the Catholic Board Council of OSTA/AECO: Nicolas Bottger (York CDSB); Manuela Zapata (Halton CDSB), Christina Atrach (Halton CDSB); Ingrid Schwecht (Halton CDSB); Mark Garabedian (Durham CDSB); Andrea Chiappetta (Simcoe Muskoka CDSB); Sarah Van Waterschoot (Durham CDSB); Sophia Trozzo (York CDSB); Rhea Carlisle (Toronto CDSB); Joel Ndongmi (Toronto CDSB); Nico Tripodi (Niagara CDSB); Kira Petriello (Niagara CDSB) and Ana Maria Babul (Halton CDSB). Students from St. Joseph College School – Toronto Catholic District School Board presented a much acclaimed art exhibit that was first displayed during Toronto’s Nuit Blanche. Entitled “Residential School Memorial” the exhibit featured illuminated Talking Sticks representing the 139 residential schools in Canada. The school also had on display the Red Dress Project which was first created by Métis artist Jaimie Black to remember and raise awareness for the missing and murdered Indigenous women of Canada. The students created their own display featuring small red dresses with messages by visitors written about prayer, hope and action. The students’ goal is to mount 4000 red dresses on this installation representing the 4000 missing Indigenous women. 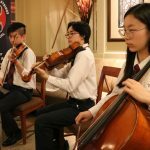 The student string quartet from Cardinal Carter Academy for the Arts – Toronto Catholic District School Board delivered exceptional classical music performances throughout the evening reception. The student soccer players and coach from Bishop Marrocco/Thomas Merton CSS – Toronto Catholic District School Board attended the reception to share with MPPs and other guests their experience visiting the community of Attawapiskat to support Indigenous students and provide soccer camp opportunities. The community of Attawapiskat has been sadly impacted by issues of youth suicide and depression and the soccer students from Bishop Marrocco/Thomas Merton CSS felt strongly about initiating and maintaining an outreach to their peers in this community. Students from the Peterborough Victoria Northumberland and Clarington CDSB who travelled to France recently as part of the worldwide commemoration of the 100th Anniversary of the Battle of Vimy Ridge were also in attendance to share their experiences about participating in this historic and important event. 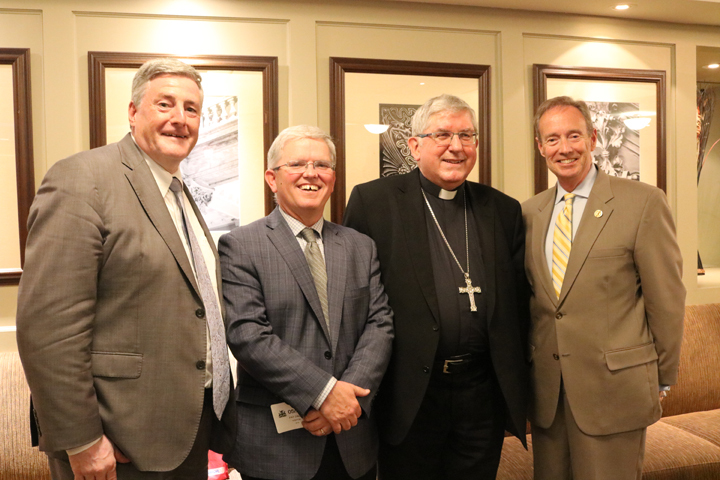 Also in attendance at the reception were representatives from a number of Catholic education partners in Ontario including: AFOCSC, Catholic Principals’ Council of Ontario, English Catholic Council of Directors of Education, Institute for Catholic Education, and Ontario Catholic Supervisory Officers’ Association. This successful event was coordinated under the leadership of FACE Project Manager, Carole Allen. 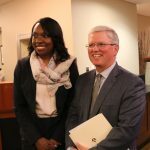 Minister of Education, Mitzie Hunter with OCSTA President, Patrick Daly. OCSTA Directors Ann Andrachuk (Toronto CDSB) and Thomas Thomas (Dufferin-Peel CDSB) with OCSTA E.D., Nick Milanetti (middle). Benoit Mercier, AFOCSC, Kathy Burtnik, OCSTA Past President, and Thomas Thomas, OCSTA Director. Please note that audio recordings of all plenary sessions and PowerPoint slides are available for download directly from OCSTA’s Members’ Centre at this link: https://www.ocsta.on.ca/2017-ocsta-event-presentations/ . 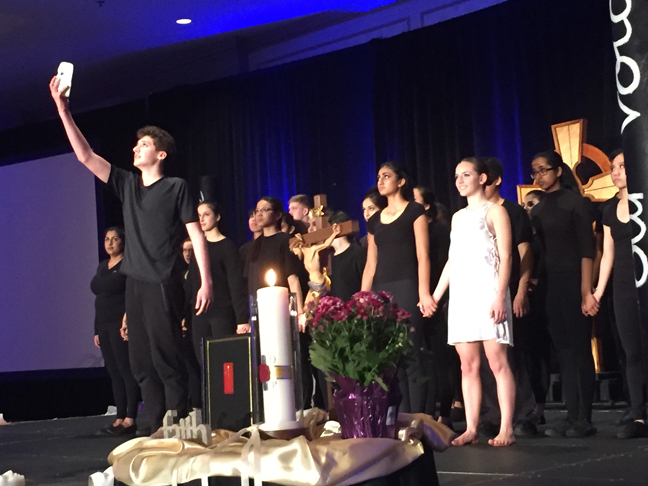 The Association wishes to thank and acknowledge the York Catholic District School Board for their outstanding contribution as the co-host for this year’s Conference and for the design, coordination and presentation of this year’s memorable Opening Liturgy. “I want to thank all candidates who stepped forward to be a part of this election. Serving as a Catholic trustee is a call to service that requires significant commitment at the local level. Choosing to serve the mission of Catholic education at the provincial level as a Regional Director is an added commitment that directly contributes to the Association’s success at advancing the priorities of Ontario’s publicly funded Catholic schools,” said OCSTA President Patrick Daly. 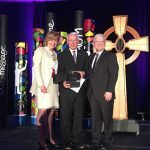 Each year OCSTA selects a trustee who has demonstrated outstanding commitment and service to Catholic education to receive the Association’s Award of Merit. The 2017 recipient is Renfrew County Catholic District School Board Trustee Andrew Bray. Andrew has served his board as a trustee for 33 years and contributed to a number of provincial education initiatives as a former member of OCSTA’s Board of Directors. This year OCSTA introduced a new award that acknowledges former student trustees in Catholic schools who have exemplified through their post graduate pursuits, the values promoted in the Ontario Catholic School Graduate Expectations. York Catholic District School Board alumna and social justice advocate Kristine Soufian. Kristine is a graduate of St. Joan of Arc Catholic High School in Maple and is now a teacher with the Toronto Catholic District School Board. Durham Catholic District School Board alumnus and nationally acclaimed mental health awareness advocate, Ben Verboom. Ben is a graduate of Denis O’Connor Catholic High School in Ajax and is pursuing a PhD in Social Intervention at the University of Oxford. 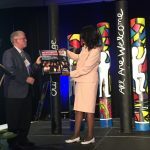 OCSTA President Patrick Daly presents Together in Faith poster to Minister of Education, Mitzie Hunter. Toronto and Brant Haldimand Norfolk Trustees with OCSTA President Patrick Daly. 2017 OCSTA 25-Year Service Award Recipients: Anita-Mallette-Snobelen, Linda Jamieson (for Barbara McCool), and Jim McCafferty. Awards presented by OCSTA VP Bev Eckensweiler and President Patrick Daly. 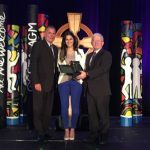 Student Trustee Alumnus Award Recipient Kristine Soufian (York CDSB) with Conference Chair, Todd Lalonde and OCSTA President Patrick Daly. 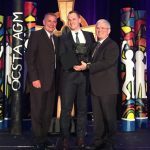 Student Trustee Alumnus Award Recipient Ben Verboom (Durham CDSB) with Conference Chair, Todd Lalonde and OCSTA President, Patrick Daly. OCSTA Trustee Award of Merit Winner, Andrew Bray (Renfrew County CDSB) with OCSTA VP Bev Eckensweiler and President Patrick Daly. 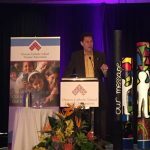 Closing speaker, TVO’s The Agenda Host, Steve Paikin. Since the inception of the Community Hubs Secretariat in 2015, OCSTA has continued to communicate to Karen Pitre (the Premier’s Special Advisor on Community Hubs) the perspectives and priorities of Catholic schools regarding Community Hubs in schools. 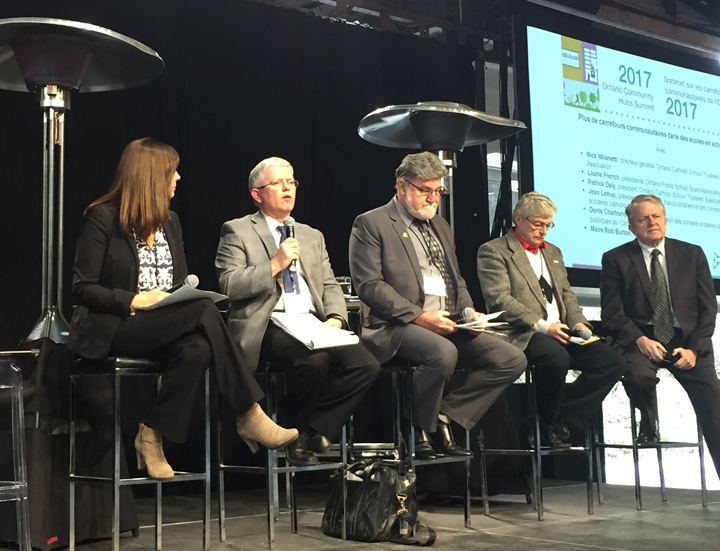 This past year OCSTA supported the Secretariat in the coordination of a Community Hubs Summit that was held May 1- 3 at the Evergreen Brick Works in Toronto. OCSTA and Ontario’s other trustee Associations participated in a panel discussion that explored the opportunities and issues regarding Community Hubs in operating schools. Participating on the panel were: OCSTA President, Patrick Daly; OPSBA President, Laurie French; Président, Association franco-ontarienne des conseils scolaires catholiques, Jean Lemay; Président, Asociation des conseils scolaires des écoles publiques de l’Ontario, Denis Chartrand, and; Rob Burton, Mayor, Town of Oakville. Director of Education, Linda Staudt of the London District Catholic School Board also participated in the Summit as a lead presenter with Lynn Livingstone, Managing Director, City of London. Together they discussed and highlighted the successful hub/Family Centre at St. Francis Catholic Elementary School (a school in the London DCSB that has excess student spaces). The Family Centre at St. Francis CES arose out of an effective partnership between the London DCSB and the City of London. In addition to the Community Summit, an online Resource Network for Community Hubs was recently launched by the Ministry of Infrastructure’s Community Hubs Division. This resource has been developed with input and insight from various provincial groups, including OCSTA, and local organizations with significant interest in Community Hubs. To join this Resource Network please visit: https://www.communityhubsontario.ca/. 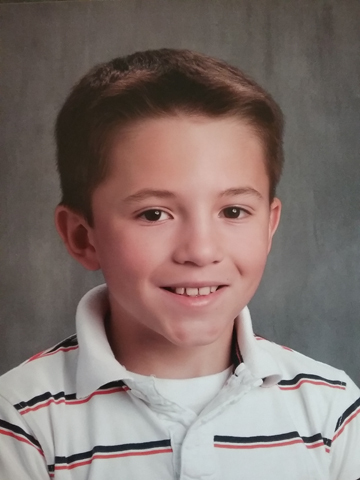 How a grade 5 Catholic elementary school student is telling his story and in the process helping a community in need half way around the world. Click here to read the whole story. Mitzie Hunter, Minister of Education, joined by Glenn Thibeault, MPP for Sudbury, was at École élémentaire catholique St. Dominique in Sudbury today to highlight Ontario’s new investments in special education. Enabling more students to achieve success in school and beyond is part of Ontario’s plan to create jobs, grow our economy and help people in their everyday lives. The 2017 Budget includes an additional investment of $6.4 billion over three years in Ontario’s education system. This reflects the government’s commitment to help learners reach their full potential by supporting them from full-day kindergarten to postsecondary education and beyond.